The Dogs of the Dow pinpointed these three stocks at the start of the year. These two remain good ideas and one is a major problem spot. An investing strategy known as the Dogs of the Dow is a quick way to find large, well-established stocks with relatively high yields. Sometimes it pinpoints great companies that are temporarily out of favor, and sometimes it highlights companies facing major challenges. These three stocks from the 2018 Dogs of the Dow highlight this dichotomy. 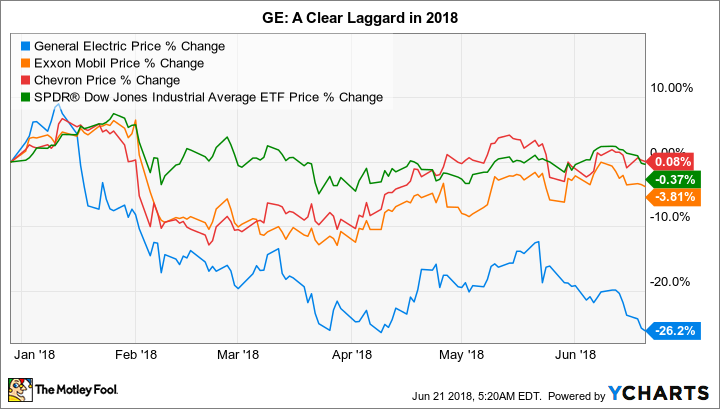 Here's why General Electric Company (NYSE:GE) needs your close attention right now, and why Chevron Corp. (NYSE:CVX) and ExxonMobil Corporation (NYSE:XOM) are still buying opportunities if you have money to invest today. General Electric's spot on the Dogs of the Dow list was already a bit concerning at the start of the year, when the list of Dogs is usually updated. That's because the company cut its dividend by 50% in the fourth quarter of 2017. The only reason it made the list this year is because its stock price fell so much that it pushed the yield into the top 10 of the Dow Jones Industrial Average. Those declines have continued into 2018. The reason for the dividend cut and stock price decline are both related to the major corporate overhaul taking shape under new CEO John Flannery. He took the helm in 2017 and immediately tempered the company's outlook. Even after the 50% dividend cut, Flannery was unwilling to back the current dividend over the long term at a recent analyst conference because the pending overhaul of the business is so large that it could lead to further cuts. Now, General Electric has been removed from the Dow Jones Industrial Average after more than 100 years of membership in this elite club. If you bought it at the start of the year using the Dogs methodology, you are supposed to hold through the full year. Although we're around half way through, the next six months are likely to remain just as troubling as the first six. There are questions about the industrial company's long-term prospects, and the corporate reshaping is huge and uncertain. GE is really a turnaround play at this point, with material recovery potential and elevated levels of uncertainty. It isn't the best fit for risk-averse investors with new money to invest and it wouldn't count as a Dog at this point if you are just starting to follow the Dogs and Dow system. If you already own it, though, you'll want to keep a close watch on the headlines. Also on the Dogs list at the start of the year were Chevron and Exxon, two of the largest integrated oil companies in the world. Price-wise, this pair of high-yield stocks has pretty much gone nowhere this year, which is basically what's happened with the Dow Jones Industrial Average. That, however, isn't a sign of trouble. Chevron and Exxon remain solid investment opportunities for conservative, long-term investors. Of the two, Chevron has been performing better as a business. For example, it was able to increase production by 6% year over year in the first quarter. That improvement coupled with higher oil and gas price realizations, led to fairly strong earnings relative to the company's peers. However, most of those peers have seen high single digit to low teens stock price advances in 2018 while Chevron's shares languish around break-even. One key reason is that Chevron is planning to limit its capital spending over the next few years to around its current level, which is around half the 2014 level of spend. Investors appear concerned that growth at the energy giant will languish. However, strong production results from its onshore U.S. energy business have supported continued production growth despite falling capital spending. Although Chevron is facing logistics issues with getting this oil and gas to market, the long-term potential of these energy assets suggests investors aren't giving the oil giant the credit it deserves for its strong recent results. If you can take a longer-term view, you can still catch Chevron's generous 3.6% yield. Exxon, meanwhile, has been struggling with falling production (it declined 3% between 2015 and 2017) and lower-than-historical returns on capital employed. Exxon has been working to fix these trends. For starters, it has been investing heavily in new exploration opportunities, which has already led to an increase in its reserves. That's likely to be a precursor to higher production as those assets get developed. A quick list of Exxon's best production growth opportunities. Image source: ExxonMobil Corporation. With regard to return on capital employed, Exxon has gone from leading the pack to simply landing in the middle of it. While not great, the oil giant isn't being left behind. It also plans to take more control of its capital projects so it can put its expertise with running large projects to better use. It hopes that this will improve its returns from the mid-single digits today to the mid-teens by 2025. So it's working on this issue, too. But investors are taking a wait-and-see attitude, which has pushed the company's price to tangible book value to its lowest point in a decade. It looks like a value opportunity today, and you can collect a roughly 4% yield while you wait for Exxon to turn the ship. At the end of the day, General Electric's transformation is still a work in progress. If you own this because it was a Dogs of the Dow stock at the start of 2018, you should be watching the company very closely and know that it won't be a Dog next year because it is no longer a Dow 30 stock. Conservative investors with new money to put to work, meanwhile, would be better off avoiding the uncertainty. That said, Chevron and Exxon continue to look like solid dividend investments. Neither is facing the near-term existential threat that GE is dealing with. If you bought this pair at the start of the year because they were Dogs, there's no particular reason to worry. Chevron is performing relatively well but hasn't been rewarded as well as European peers by investors for its success. Exxon, though, continues to face some issues, but has a plan to deal with them. Investors looking at the stocks now will need to take a long-term view, but their notable yields should reward you well while you wait for better days.